The backyard barbecue: even a presidential pleasure! Springtime means barbecue time in Nashville and all over the US! There are few activities as rewarding this time of year as preparing meals and dining outdoors with friends and family. It seems like a “rite of passage” as we welcome the outdoor living season. As Americans, it seems we have a natural affinity to cook outdoors and especially here in the South where the backyard barbecue is considered a food group. Every culture has some version of the pursuit of outdoor cooking perfection — from the Argentinean Asado to the traditional Hawaiian luau. Rituals and traditions swirl around grilling, and outdoor food preparation. 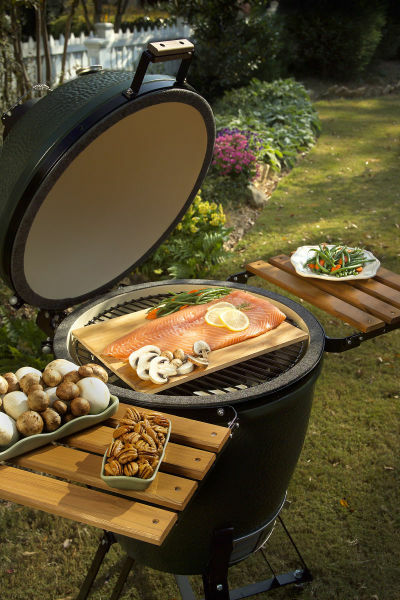 Salmon and grilled veggies prepared on The Big Green Egg — yummy! The word “barbecue” was introduced to the American colonies from Haiti which originally referred to the grilling rack, and then to the meat itself. By 1733 it also represented a social gathering that revolved around roasting an animal. By 1931, Northerners and Westerners would be using the word to describe any outdoor event involving meat and coals. 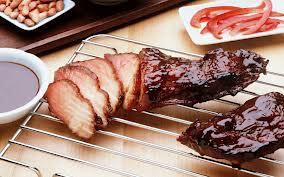 (The word “Asado” has a similar dual meaning in South America, where it used to describe a grilling technique and a social function.) Not much has changed in the way we view the “act” of cooking outdoors as a time for social gatherings, our outdoor spaces have even evolved to make cooking and dining the main attraction of many American backyards– From Big Green Egg smokers to gourmet outdoor kitchens outfitted with all the bells and whistles that rival the best interior kitchen.The backyard cook out remains a tradition that centers on food, family, fun and friends! Even our nation’s forefathers got in on the barbecue bandwagon according to research, George Washington, actually recorded all the barbecues he attended or hosted. Here is an example of one such entry from August 4, 1769, which reads: “Dined at the Barbecue with a great deal of other Company and stayed there till Sunset.” another reads “Went in to Alexandria to a Barbecue and stayed all Night.” So, not only was Washington our first president, he was also responsible for our first presidential barbecue. Washington, our first president, was also responsible for our first presidential barbecue. Today’s barbecue has changed in one sense, however, as it now involves preparing more than just meats. With an impetus on healthy eating habits and healthy lifestyle choices, we now enjoy many items prepared outdoors from slow-roasting chick peas for a fabulous humus to grilling delicious vegetables. There is really no limit to the culinary creations you can prepate and enjoy outdoors! Our team here at Outdoor Lighting Perspectives of Nashville also loves to prepare and dine outdoors with friends and family. With that in mind, our own Bob Lyons Jr. has shared his mouth-watering recipe for roasted salmon. This recipe is a variation of a recipe taken from the Sublime Smoke cookbook, we call it “Bob’s Fab Smoked Salmon”… enjoy. 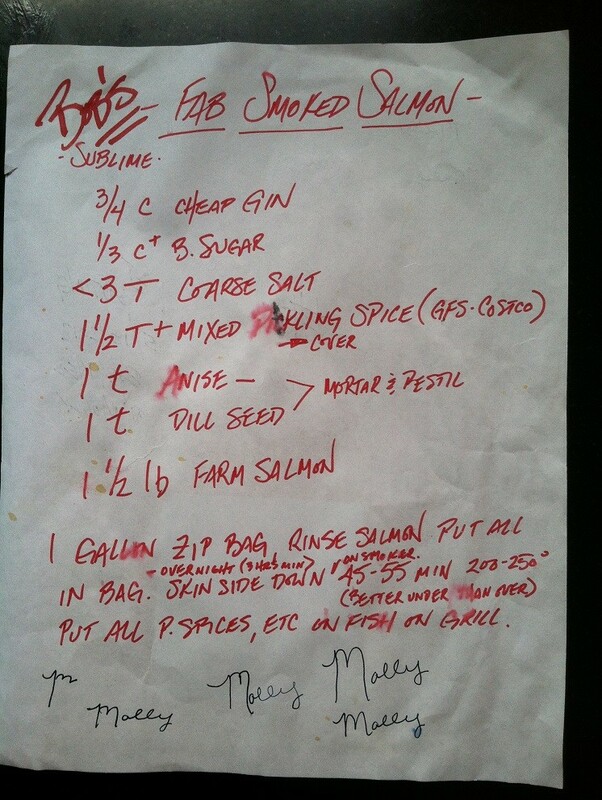 Bob’s Fab Salmon Recipe. Originally written with help from Bob’s daughter, complete with drippings from the smoker! This entry was posted in Outdoor Lighting, Outdoor Living in Nashville and tagged Bob's Fab Salmon recipe, Bob's Fab Smoked Salmon, Landscape Lighting, Nashville outdoor cooking recipe for Salmon, Nashville outdoor living, outdoor lighting Nashville, Outdoor Lighting Perspectives of Nashville, The Big Green Egg, The origins of the outdoor barbecue by outdoorlightingnashville. Bookmark the permalink.